The relationship among the aesthetic, cognitive, and ethical values of a single work of art or of art considered as a practice or an institution is the subject of much debate. Even if one accepts relatively uncontroversial definitions of each type of value—the value of a work of art as a work of art (aesthetic), the value of a work of art in providing knowledge (cognitive), and the virtue of the perspective embodied by a work of art (ethical)—the extent to which each interacts with one or both of the others is far from clear. Is, for example, the knowledge provided by a work of art part and parcel of its aesthetic value, and is a work that misrepresents reality consequently aesthetically weaker than a work that does not? Is truth a criterion of ethical evaluation and, if so, is the cognitive value of a work of art part and parcel of its ethical value? I set out my initial views on these and related questions in a paper entitled “A Critique of the Value Interaction Debate,” where I concluded that the three values should be regarded as independent of each other in the absence of a satisfactory answer to these questions being provided. What I want to do in this post is show that aesthetic value, cognitive value, and ethical value cohere in the concept of authenticity. I shall do this by applying the methodology that Murray Smith sets out with such clarity and rigor in Film, Art, and the Third Culture: A Naturalized Aesthetics of Film, the search for triangulation among competing modes of explanation. The study of film, as an artistic medium with a firm basis in modern technology, requires a combination of knowledge of both artistic and scientific method, of the aesthetics of painting, poetry, theater, and music and of the disciplines of phenomenology, psychology, and neuropsychology. Smith’s intellectual USP is not the way in which he employs cinema to illuminate questions at the aesthetic, philosophical, and cultural levels, but the way in which he triangulates the phenomenological, psychological, and neuropsychological explanations at the philosophical level. He employs numerous examples to demonstrate how the experience of mental phenomena, the information processed in relation to mental phenomena, and the physical realization of the mental combine to clarify features typical of the cinematic experience, such as suspense and empathy. Cinematic experience is constituted by both top-down and bottom-up processes, and Smith’s insight is that the numerous cases where phenomenological, psychological, and neuropsychological explanations intersect provide a hitherto unacknowledged degree of certainty about that experience. In "Authenticity from Heidegger to Fanon" I examined Martin Heidegger’s conception of authenticity in Being and Time (1927) and argued for the combination of authenticity as a way of life that acknowledges the significance of human mortality with a morality derived from the recognition of the role of others within that way of life. I claimed that Heidegger’s version of being true to oneself as being-ever-at-the-point-of-death could be conceived as truth to oneself in projecting toward shared ends of one’s own choosing. This is authenticity understood as an ethical value. Although philosophical interest in authenticity goes back to Socrates, the notion of being true to oneself was a product of the slow shift in emphasis from divine to human values during the Renaissance, the Enlightenment, and the Romantic Era, and Romanticism introduced expressive authenticity as a value of art. Expressive authenticity refers to the authority of the artist, truth to the character of the artist, or a combination of the two, and I want to consider it as a cognitive value of art. The many ways in which works of art provide knowledge are subject to a bewildering range of descriptions, most of which fall into one of two categories. In the first, the artist attempts to achieve likeness in representation by means of transparency and objectivity, i.e., the creator recreates the objects of perception for the audience. Color photographs are (typically) paradigmatic in this respect, providing (relatively) objective knowledge about the world, knowledge that is as transparent as possible given the filter of the artist. In the second, the artist attempts to achieve life-likeness in representation by means of opacity and subjectivity, i.e., the creator recreates his or her experience of perceiving the objects for the audience. Impressionist paintings are (typically) paradigmatic in this respect, providing (relatively) subjective knowledge about the world, knowledge that is opaque as deliberately filtered through the artist’s experience. One can thus distinguish two types of cognitive value of art, accuracy as truth in art and authenticity as truth to lived experience or truth to life. The cognitive value of authenticity is usually, although not necessarily, more significant than the cognitive value of accuracy in works of art. In contrast, scientific practice is usually, although not necessarily, intended to be accurate rather than authentic. This is not to say that accuracy cannot be a value of art or that accuracy should not be a value of art, but that works of art standardly have a greater potential for authenticity than accuracy. Authenticity understood as a cognitive value is therefore truth to life by providing knowledge of the artist’s experience of the world. The ethical and cognitive sketches of authenticity provided thus far are similar in that they both prioritize individual subjectivity while recognizing and acknowledging the subjectivity of the other. In the same way that the ethical subject must select projects that are other-regarding in order to avoid an absurd death and life, so the artist must represent his or her subjective experience in a manner that can be understood by his or her audience in order for the work to succeed. The conceptions are also complementary rather than contradictory: returning to the Romantic celebration of genius, there is no inherent conflict between the expression of one’s projects and character by means of sharing one’s experience of the world, and as long as the authenticity expressed in the work of art is true to the life of the artist, then the ethical value does not detract from the cognitive value. One might also expect that a rich and complex projection toward carefully considered ends is expressed in an imaginative and nuanced manner by an artist, which introduces authenticity as an aesthetic value. Aesthetic value is often conflated with artistic value, but Bence Nanay offers a refreshingly simple definition in Aesthetics as Philosophy of Perception, stating that aesthetics is about ways of perceiving the world that are really rewarding and special. For Nanay, this involves both a particular kind of attention in perceptual psychology and Kant’s claim from the Third Critique (1790) that aesthetic attention is characterized by disinterested pleasure. In The Value of Literature I described aesthetic value in terms of the satisfaction derived from the simultaneity and interactivity among the sensory, affective, imaginative, and intellective aspects of the experience afforded by a particular work of art. Romantic film-philosophy argues that cinematic works can provide knowledge about either their own mode of representation or broader ethical issues in virtue of their style and form. In New Philosophies of Film: Thinking Images, Robert Sinnerbrink contrasts romanticist and rationalist approaches to theorizing film: where the latter seeks to explain film experience by using the resources available to philosophy, the former seeks to interpret film experience as an alternative way of thinking. In other words, the romanticist approach draws on Romantic epistemology, which includes authenticity as a cognitive value of art, to situate the experience of film in a dialogue with philosophy. Sinnerbrink acknowledges his debt to Stanley Cavell, upon whose work Stephen Mulhall also draws, and the three can be classified as practicing Romantic film-philosophy. The essence of the approach is the focus on the aesthetic aspects of cinema and the claim that these stylistic and formal elements contribute to the cognitive values of cinema. Romantic film-philosophy argues that cinematic works can provide knowledge about either their own mode of representation or broader ethical issues in virtue of their style and form. Given Smith’s emphasis on the aesthetic and technological means employed to produce suspense and empathy (two examples selected from many), Film, Art, and the Third Culture places him firmly in this category. The approach articulates authenticity as an aesthetic value in terms of the way in which a cinematic work engages in dialogue with philosophy by cinematic means, i.e., truth to the mode of representation. Romantic film-philosophy therefore triangulates the three values of art with which I am concerned: ethical, cognitive, and aesthetic. Ethical and cognitive values are linked by the authentic emphasis on individual subjectivity on the one hand and cognitive and aesthetic, and ethical and aesthetic, values are linked by the realization of authenticity in its ethical and cognitive instantiations through the aesthetic dimension of cinematic works on the other hand. The values are complementary rather than contradictory, as a brief but significant example will show. Terrence Malick read philosophy under first Cavell at Harvard and then Gilbert Ryle at Oxford, where he was dissuaded from pursuing doctoral research on the existential concept of world. He returned to America, teaching with Hubert Dreyfus at MIT while working on the first English translation of Heidegger’s The Essence of Reasons (1928). Malick left philosophy for film in 1969, the same year the book was published, and enjoyed early critical success with Badlands (1973) and Days of Heaven (1978). After a 25-year hiatus, he returned to the screen with the magisterial The Thin Red Line, which was both a critical and commercial success. The film, which is very loosely based on James Jones’s 1962 novel of the same name, is set during the Battle of Guadalcanal, but is not a war film, i.e., not about a particular mission, battle, or campaign. The Thin Red Line is, rather, an exploration of several of the central concepts of Being and Time, including being itself and world, but especially and explicitly authenticity, which is reanimated by Malick as calm. Attention is drawn to the word on the first occasion in which a voice-over is identified with a point of view—of Private Witt (played by Jim Caviezel), the protagonist—in the fifth minute of the film. With combat on the horizon, Witt compares his own future death with his mother’s past death and muses, “I just hope I can meet it the same way she did. With the same… calm.” Over the next two hours of the narrative, numerous characters confront the loss of their lives or their values in a variety of different ways, demonstrating the full range of human comportment from courage and resolve to absurdity, despair, and panic. Then, well into the last half hour of the film, there is a curious scene where Witt, hurrying to rejoin his company, stumbles across another private on his own. The man, Ash (played by Thomas Jane), has been left behind courtesy of his wounded leg and Witt twice offers to assist him to safety. After the second offer, Ash replies, “No, it’s nice and quiet—peaceful—up here. I’ll just slow you up. There’ll be somebody along.” The quiet, peacefulness, and Ash’s complete calm in the face of the rapid changes of fortune of war provide a subtle reminder of the meditation on calm with which the film began. A little over ten minutes later, following a heroic act of self-sacrifice, Witt finds himself surrounded by a full platoon of Japanese soldiers. Given that his comrades have already escaped and that he is neither fanatical nor patriotic, he makes what appears to be a strange choice in refusing to surrender and, in effect, committing suicide. The action is, as the encounter with Ash has reminded the audience, Witt’s exercise of his authenticity and he succeeds in facing his own death with the same unflinching courage with which his mother faced hers. The Thin Red Line is a particularly effective example of authenticity triangulating the ethical, cognitive, and aesthetic values of a film because it is self-reflective. The ethical value of the work is Malick’s authentic expression of his project to reanimate authenticity as calm. Authenticity as an ethical value is thus realized in the narrative movement from calm to chaos and then back to calm. 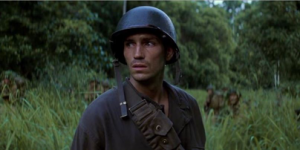 The Thin Red Line provides knowledge of the subjective experience of its protagonist—not just Witt, but several others as well—and the intersubjective intersections, confrontations, and collapses of subjective worlds are represented with the subtlety and sophistication for which Malick is renowned. The work is thus true to life or authentic in the cognitive sense. Both the ethical perspective of and the truth to life in the film are communicated by aesthetic devices, particularly but not exclusively Malick’s innovative use of voice-overs, cameras, lighting, and flashbacks. The Thin Red Line is thus authentic in its ethical project, in its truth to life, and in its truth to its mode of representation and the necessarily brief example demonstrates the alignment of the three evaluative dimensions of the concept. The approach employed to articulate cinematic romanticism may well be applied beyond the art form of film—in imitation of the Romantic poets, painters, and composers—but I have restricted my claim to film because the Romantic film-philosophy of Cavell, Mulhall, Sinnerbrink, and Smith completes the triangulation of values among the ethical, cognitive, and aesthetic. In the same way that film links Smith’s contributions to aesthetics, philosophy, and culture so authenticity links the ethical, cognitive, and aesthetic values of film in my considerably less ambitious proposal. Rafe McGregor is Lecturer in Criminology at Leeds Trinity University. His research specializations are narrative justice and policing. He is the the author of The Value of Literature, The Architect of Murder, The Adventures of Roderick Langham, two novellas, four collections of short stories, and numerous articles, essays, and reviews. His most recent book is Bloody Reckoning. He is Associate Lecturer at the Centre for Lifelong Learning at the University of York, where he runs the Exploring Human Values lectures and workshops.